What, did you expect us to take a day off from our division preview series? Hogwash! We’ve had our say on the AL East, Central, and West, and we’ve chimed in on the NL East. Today, we’re diving into the NL Central, and we’ll wrap things up tomorrow with a detailed breakdown of the NL West. Hooray for baseball! Welcome to Grantland’s preview of the Kris Bryant Chicago Cubs CBA Boras-Epstein Service-Time Discussion Division — also known, to those of you who don’t take search-engine optimization seriously, as the NL Central. The Cubs’ rebuilt roster and their front office’s finessing of Bryant’s future earning potential are the spring’s most talked-about topics, but despite what the glut of headlines might lead you to believe, Chicago isn’t the Central’s only (or best) baseball team. The Cardinals and Pirates have brought back the rosters that made them playoff teams last season (with a few vital tweaks), while the Brewers and Reds have graciously agreed to continue playing, mostly to give Bryant more looks at live pitching. Scroll down to see stats, story lines, and projections for each team. Best Offseason Move: Adding Jason Heyward was the mic drop that began and ended the Cardinals’ significant offseason activity. Thanks to Heyward, the Braves ranked second on the 2014 WAR leaderboard for right field; the Cardinals finished second to last. Making a move to climb that leaderboard in 2015 cost the Cardinals young pitching and eight cumulative seasons of team control, but the October death of top prospect Oscar Taveras forced GM John Mozeliak to go outside the organization to patch the roster’s weakest point. Departed starter Shelby Miller will be missed if Adam Wainwright suffers any ill effects from his age (33), heavy workloads, or offseason elbow surgery; Michael Wacha’s 2014 scapular stress fracture recurs; or Carlos Martinez has trouble transitioning to the rotation, but the chance to turn a shortcoming into another strength was worth the price. Worst Offseason Move: Failing to add catching depth. The Cardinals responded to Molina’s injury-related absence last summer by signing seemingly every recently discarded catcher in sight. (George Kottaras, come on down!) A.J. 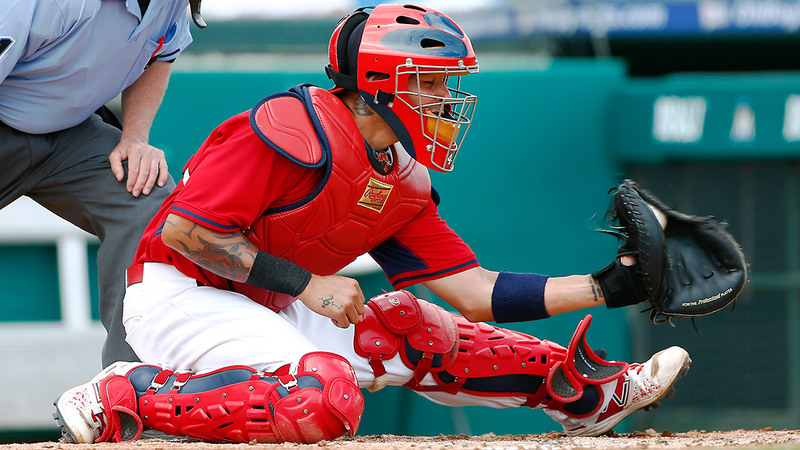 Pierzynski, who was still on the Red Sox a week after Molina went down, started almost as many games for St. Louis during Molina’s DL stint as incumbent backup Tony Cruz did, which told us how happy St. Louis was with Cruz in a leading role. Yet in an offseason when a number of teams traded better backup options like Hank Conger and Carlos Corporan, the Cardinals stuck with Cruz. Admittedly, when your biggest complaint about a team is that it didn’t find a better backup for one of baseball’s best, most durable players, you know you’re nitpicking, but if the Cards aren’t comfortable with Cruz answering the 3 a.m. call about a missing Molina, better options were out there. Greatest Team Strength: The players, probably. The players are pretty good. It’s hard to get more specific than that. In my AL West preview, I mentioned the projections generated by Mitchel Lichtman, the sabermetric consultant and coauthor of The Book. Lichtman’s system rates each team’s offense, defense, and pitching in projected runs above average, drawing on the playing-time estimates in the FanGraphs depth charts. The Cardinals project to be plus-53 on offense, plus-33 on defense, and plus-36 on the mound. It’s not necessarily better to rate well in all three categories than it is to be among the best in two categories and middling in the third, like the Dodgers and Nationals. Still, St. Louis is the only team with better than plus-10 ratings in all three categories, let alone plus-30. If the Mariners’ (plus-22/plus-10/plus-18) strength was their lack of weaknesses, the Cardinals’ is their lack of things they don’t do really well. Greatest Team Weakness: Finding a weakness on the Cardinals roster is the Kobayashi Maru test for team preview writers: There’s no satisfying solution. If there’s one thing the Cardinals can’t do, though, it’s send up an imposing pinch hitter. Manager Mike Matheny hasn’t had a good bench bat the last two Octobers — remember Adron Chambers? — and Mark Reynolds is the best backup hitter he can call on today. So I guess I’m saying that St. Louis’s weakness is not building a bench full of players who could start for other teams but chose to pass up playing time elsewhere for a taste of that sweet, sweet Cardinals Way. Come on, Cardinals — you have 25 roster spots, so why stop at 20 really good players? Be better at baseball, already. Player We Can’t Wait to Watch: Apologies to Pete Kozma, but it has to be Heyward. For starters, it’s entertaining to watch someone who might have the skills for center play the most overqualified corner outfield since a young Carl Crawford. What’s more, Heyward’s fluctuating offense adds an element of mystery to the season, heightened by the anticipation of his upcoming contract. Will sliding out of the leadoff spot bring back Heyward’s bat, or is there more to his missing power? And is the 20-year-old rookie who recorded a 134 wRC+ gone for good, or does Heyward have a second season at that level in him? The story of this story is that it won’t stop developing. Noteworthy Miscellaneous Stat: We know the Cardinals have been especially lucky, skilled, or some combination of both in the draft. 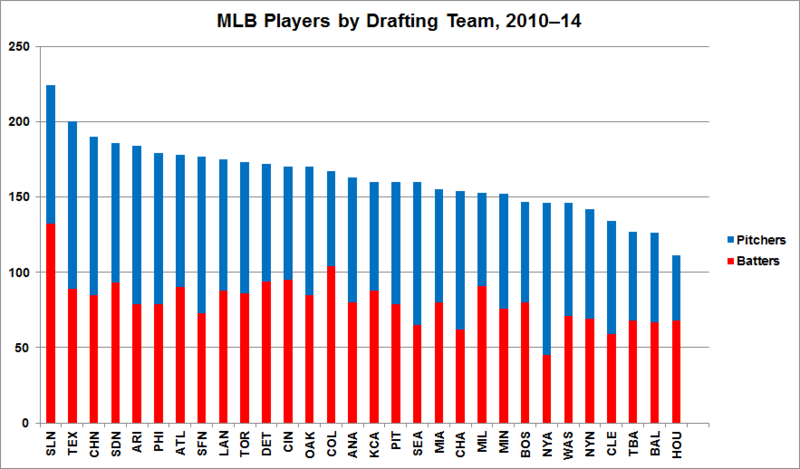 This chart shows the number of players who’ve appeared in the majors over the past five seasons, broken down by drafting organization (or most recent drafting organization, in the case of players who were drafted more than once). The Cardinals have drafted the most major leaguers. Because their drafts have been so fruitful, they haven’t had to spend as much as many other teams on free agents (and, in a virtuous circle, they haven’t wanted to spend as much, because doing so would have deprived them of picks). There’s one exception, though: St. Louis signed Matt Holliday to a seven-year, $120 million free-agent contract before the 2010 season, 10 days before Holliday’s 30th birthday. It’s the only nine-figure free-agent deal the franchise has ever awarded. And while it wasn’t as risky as a contract of the same size for a pitcher would’ve been, it was still a promise to pay a bat-only player large sums of money into his late thirties, which rarely results in a great return on investment. So here’s a reminder that St. Louis truly leads a charmed life: the WAR leaders over the past five seasons among players who were 30 or older in 2010. If the Cardinals had gotten their pick of any player age 30 or over, they could hardly have done better than they did by signing Holliday. According to the free-agent values at FanGraphs, the going rate for Holliday’s production over the past five seasons would have been $105.3 million. If Holliday is worth as much over the next two seasons combined as he has been in any one year of the contract thus far, the Cardinals will come out ahead, without making any adjustment for inflation. The Cardinals are too smart to splurge on free agents regularly. But when they do, damned if it doesn’t work out for them. Off-Field Story Line: This has been a Heyward-heavy breakdown, but that’s only because Heyward hasn’t been in St. Louis long enough to be as boring as the rest of the roster. The Cardinals’ new toy won’t turn 26 until August, but he’ll qualify for free agency a few months after that, which means he’s about to make either many millions of dollars or many, many millions of dollars. His health and his hitting will be the biggest determinants of the first few numbers in his nine-figure contract, but the Cardinals’ firsthand experience will help them decide whether he’s worth what he’ll cost to extend or re-sign — and, if they conclude that he is, help persuade him to stay. Although the team has a history of extending recent acquisitions, Heyward won’t take an oath of poverty just for the pleasure of playing in front of baseball’s [Best!/Worst!] fans, but if he’s willing to take a slight discount, that might do it. St. Louis should have some payroll room with Jaime Garcia (after this season) and Holliday (after next season) approaching free agency. Projected Record and Over/Under: 88-74 — OVER. The Cardinals won 90 games last season — enough to earn them a fourth straight trip to the playoffs — but they had the run differential of an 83-win team. Winning 83 games hasn’t been such a bad thing for St. Louis this century, but the Cards will be better than that this year, thanks to their big gain in right field and the continuity on the rest of the roster. The A’s poached Cardinals scouting director Dan Kantrovitz this winter, just as the Astros poached the team’s previous scouting director, Jeff Luhnow. But the bounty from their drafts continues to make the Cardinals the division favorite. Best Offseason Move: Braving the unknown performance translations of players from the Korea Baseball Organization to sign almost-28-year-old Jung-Ho Kang for four years and $16 million (posting fee included) was pioneering and probably smart. Francisco Liriano’s three-year, $39 million deal seemed sensible. The Justin Wilson–for–Francisco Cervelli exchange made sense. But Burnett’s return to Pittsburgh earns the offseason crown — partly because of the signing, but mostly because of the circumstances surrounding it. You think you’ve made fun of the Phillies because you’ve dropped a burn or two on Twitter, or made a joke about GM Ruben Amaro and OBP in a comments section he’ll never see? You haven’t begun to troll like the Pirates’ 38-year-old starter. Burnett declined a $12.75 million player option with the Phillies, his 2014 club, to rejoin the Pirates, his 2012 and ’13 team, for $8.5 million. That means he passed up over $4 million just to avoid playing for Philadelphia. So snap off a salute to that man, and give him a HOKA HEY. Yes, Burnett had offseason surgery to repair an inguinal hernia that plagued him last season, and yes, it’s possible he’ll pitch well enough to be a bargain for non-Phillies-related reasons. But right now, his pitching is beside the point: Burnett already won the winter. Worst Offseason Move: The Travis Snider trade, which sent Snider to the Orioles for 22-year-old A-ball pitchers Stephen Tarpley and Steven Brault. There wouldn’t have been many starts in the outfield for Snider if he’d stayed, so it’s possible he planted the idea by browsing Baltimore real estate listings on a clubhouse computer until GM Neal Huntington took the hint. If the Pirates initiated the swap, though, it was a strange one: Snider was probably the Bucs’ best option as a left-handed outfield bat off the bench, a role that now falls to the defensively limited Andrew Lambo. It’s a marginal downgrade, but this is also a curious time for the Pirates to be making a future-oriented move. Greatest Team Strength: The Pirates’ resurgence over the past two seasons has been closely associated with their run-prevention hacks, namely a staff that throws sinkers and gets grounders, aggressive infield shifting, and good pitch framing. All of those tactics have been (and continue to be) part of Pittsburgh’s success, but the 2014 team owed its wild-card berth to offense above all. Last year, Pittsburgh’s nonpitchers tied for the highest wRC+ in the league. While Harrison is bound to regress and Russell Martin bounded off to the Blue Jays, the Pirates can expect improvement at first base, where Alvarez should outhit last year’s Ike Davis–Gaby Sanchez platoon, and in right field, where Gregory Polanco should outhit last year’s Gregory Polanco. Greatest Team Weakness: The rotation. Aside from Gerrit Cole, it’s a ragtag, undependable group. Liriano’s second straight competent season brought a sense of relief that shouldn’t reassure anyone about his odds of extending the streak; like Liriano, Morton and Burnett are significant injury risks, but unlike Liriano, they’re probably no better than back-end guys even if healthy. The bulwark against that uncertainty is pitching coach Ray Searage, who’s widely believed to be a pitching whisperer. Searage has an impressive record of getting more out of arms than one would expect, although his career as Pirates pitching coach spans only four seasons; he seems to have the magic touch, but some coaching gurus turn out to have short shelf lives. Pittsburgh’s lineup is close to fully developed, but the pitching staff is still in the gangly, growth-spurt stage between placeholders like Jeff Locke and prospects like Nick Kingham and Jameson Taillon, both of whom could be up at some point this season. 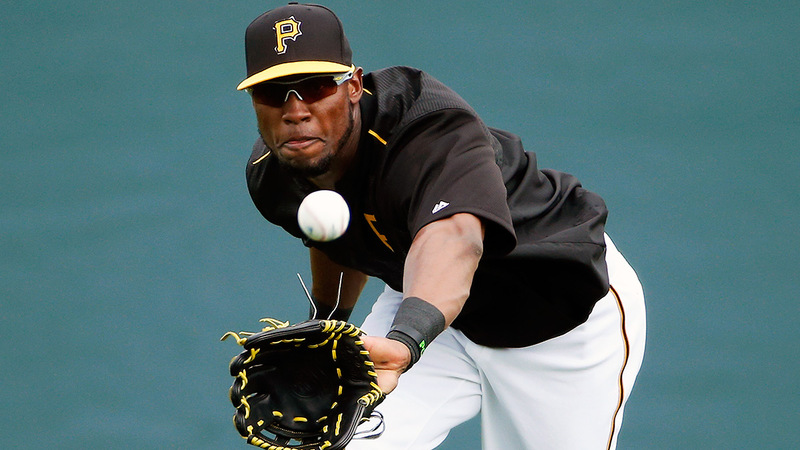 Player We Can’t Wait to Watch: Starling Marte, 26, is fun to watch for at least four reasons. First, over the past two seasons, he’s been the game’s second-most-valuable runner, not so much because of his stealing (he’s prolific but inefficient) as his less obvious contributions on the bases. Marte’s 58 percent extra-base-taken rate last season ranked 11th out of 199 hitters who were on first for at least 20 singles, and he reached on an error — which is a skill — 14 times, the most in the majors. He also grounded into the 10th-fewest double plays from 2013 to 2014, thanks to his legs and his tendency to hit balls into the air. Secondly, Marte has been hit by 41 pitches over the past two seasons, the most in the majors. That’s approximately one hit-by-pitch every 27 plate appearances, a rate almost 20 percent higher than any other qualifying player’s. Thirdly, Marte also has the second-highest BABIP of any qualifying hitter in his two full seasons, thanks to his speed, high line-drive rate, and low popup rate, all of which make his batted balls more likely to turn into hits. Finally, he’s an excellent defender, ranking behind only Alex Gordon in Defensive Runs Saved by left fielders over the last two years. His arm ratings aren’t anything special, but the videos are. Those are all minor skills that add up to something significant. After last year’s All-Star break, though, Marte made mechanical adjustments and mashed in a way that was difficult to overlook: Only Buster Posey hit better in the second half. The Pirates could be on the verge of having a second superstar, and their outfield — which was hyped before its final member made the majors — has already entered the mythmaking stage. Noteworthy Miscellaneous Stat: The Pirates are the only major league team with no projected regulars in their age-30 or older seasons: Until Neil Walker turns 30 in September, the Pirates could have an all-twenties starting lineup. Nine under-30 Pirates made at least 300 plate appearances last season, which isn’t especially uncommon: The Rockies and Padres also reached that mark in 2014, although they didn’t do it while contending, which is more difficult. A team with 10 under-30 players hitting that mark is much rarer: The last club to do it was the 2002 Twins, who made the playoffs six times in nine seasons between 2002 and 2010. The Pirates would be thrilled if their precocious roster allowed them to replicate those Twins teams’ sustained small-market success. Off-Field Story Line: The (slowly) rising payroll. It’s unfortunate that the Pirates weren’t players for Martin, whom they would have loved to bring back, but their payroll has reached record levels even with just $2.2 million committed to their catchers this year (while employing the same Cervelli–Chris Stewart framing-first plan that the Yankees used to try to replace Martin in 2012). Of course, while an uptick in attendance and TV revenue has helped the Pirates increase their spending, their competitors have invested enough that even Pittsburgh’s inflated payroll remains in MLB’s bottom quartile. Despite those constraints, though, Huntington didn’t ignore any obvious sinkholes this offseason, and he avoided making any commitments that could hamper his flexibility in the future. Now we’ll wait to see whether owner Bob Nutting’s bank account is limber enough to accommodate a Polanco extension — and, eventually, a McCutchen extension that won’t be as team-friendly as the first one — on top of the Pirates’ other spending. Projected Record and Over/Under: 85-77 — OVER. The Pirates suffered the fewest injuries of any team last year, and while there’s little consistency across seasons when it comes to team injury totals, the Pirates have youth and mostly clean medicals (the primary predictors of player health) on their side. The team’s potential for durability and breakouts outweighs its risk of injury stacks and sudden declines. And even if the Pirates can’t prevent problems from arising, they might be able to mitigate them: Harrison, Kang, and Sean Rodriguez give them three multi-position players who can save them from a sub-replacement scrub in the event that an injury does occur, a minor but measurable advantage. The Pirates aren’t the division’s most talented group, but they might be the majors’ most likely team to avoid the pitfalls that prevent players from fulfilling their projections. Kris Bryant and Javier Baez will be promoted from the minors to man third and second base, respectively, when their service clocks and/or strikeout rates say it’s safe to proceed. Biggest Projected Hitter/Pitcher Improvement: Miguel Montero, 1.5 WAR/600 PA; Edwin Jackson, 0.5 WAR/200 IP. 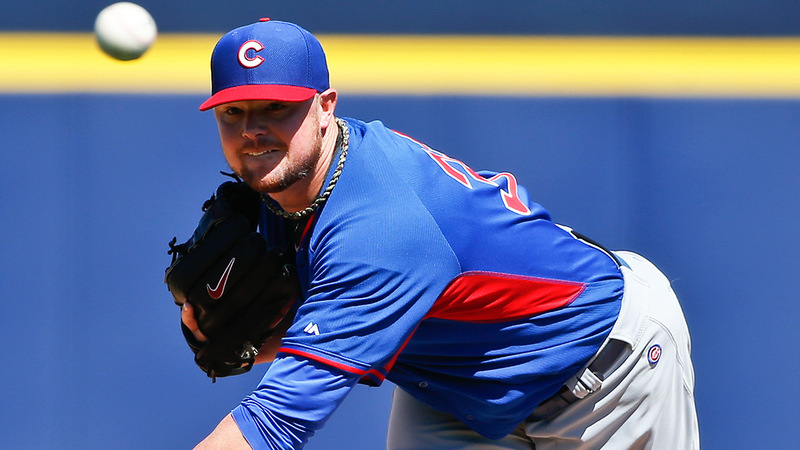 Best Offseason Move: The Jon Lester signing. There’s no need to get cute: Sometimes the blockbuster is the best move, and the ability or willingness to offer the most money is the main differentiator between front offices. While other moves (like the Montero acquisition) might end up grading better by measures of spending efficiency like dollars per win, those metrics aren’t what a big-market team like the Cubs will be judged by. They’ve constructed their roster around position-player prospects, about whom no one says “there’s no such thing.” It’s a smart way to protect their prospect portfolio; by developing a fieldful of high-ceiling hitters who are less likely than pitchers to break down and disappear, the Cubs have given themselves the payroll room to import stress-tested aces like Lester, who’ve survived the early-career injury nexus and are now only moderate risks. By design, the Cubs didn’t have an internal Lester analogue, so this signing (or one like it) was always part of the plan, which is still proceeding smoothly. Worst Offseason Move: Failing to reprogram Jackson’s GPS in a way that would send him to the Bermuda Triangle for bad contracts instead of to a nearby ballpark. Otherwise, the Cubs made intelligent upgrades at positions where they were weak last year. Cubs center fielders finished 28th in the majors with 1.1 WAR, so they traded infielder Luis Valbuena to Houston (who would otherwise have blocked Kris Bryant or Javier Baez) for Dexter Fowler. Cubs catchers finished 26th with 1.1 WAR, so they added Montero (although incumbent Welington Castillo is still waiting for the other transaction to drop). Cubs starting pitchers finished in the middle of the pack, so they signed Lester and Hammel, who of late only travel between teams together. Installing good players at positions where once there were bad players, without eating into the team’s prospect stockpile, was the best outcome Cubs fans could have hoped for. Greatest Team Strength: The Lester-led starting staff is projected to be the seventh-best in baseball, largely because of its most expensive addition. But Arrieta pitched at an ace-like level after his return from injury last May and has the stuff to sustain that performance if his health holds up,2 and the guys behind him are all decent fits for their rotation slots. A groin strain will force Tsuyoshi Wada to start the season in Triple-A, but once he’s healthy, he’ll be a better backup than Jackson or the banged-up Jacob Turner. Unless Lester’s lack of pickoff attempts ruins him forever, the Cubs should have enough pitching to keep the playoff dream alive. Greatest Team Weakness: The Cubs’ wealth of young position players will be the backbone of future division favorites, but entering 2015, the bottom half of Chicago’s order is still unsettled. The planned Coghlan–Chris Denorfia platoon in left field, where the Cubs ranked ahead of only the Phillies in WAR produced last season, is a trouble spot, with only the Braves and Rangers projected for less value from the position. Tommy La Stella and Mike Olt aren’t inspiring, but Baez’s strikeouts are still a festering sore, and Bryant won’t necessarily be a monster from the start. The young Cubs could be clicking by summer and homer happily ever after, but it wouldn’t be a shock to see it take until 2016. Player We Can’t Wait to Watch: Bryant, of course, although the Cubs decided we could wait to watch him, at least until mid-April. (More on that in a moment.) The game’s top prospect is an easy choice for most anticipated player, because watching him hit titanic opposite-field bombs will be the best show in baseball until the novelty wears off (in, oh, about a decade or so). Bryant’s .425/.477/1.175 spring training display didn’t teach us that much — the pitchers he faced were of roughly Triple-A quality, and we learned last season that he could crush Triple-A — but seeing him on the same field as the big leaguers baited the hook. Bryant did strike out in 31.8 percent of his big league spring training plate appearances, which is almost exactly what he’s projected to do in the majors (31.1 percent). Not many whiff-prone hitters have the power to make their rare contact count enough to survive so many misses, but Bryant will be one of them. Noteworthy Miscellaneous Stat: Although team win projections are usually expressed as a single figure, there is an unseen range between the best-case and worst-case scenarios. For instance, while ZiPS, Dan Szymborski’s projection system, forecasts the Cubs to finish third in the Central, their 90th-percentile winning-percentage projection — the scenario in which every player performs at the peak of his personal range — is the same as second-place Pittsburgh’s and higher than the first-place Cardinals’. However, the Cubs also have the lowest 10th-percentile projection of the three teams: Their highs are unusually high, but their lows are unusually low. Consequently, the gap between their 10th- and 90th-percentile projections is 14 wins, bigger than that of any other MLB team. That jibes with our intuitive uncertainty about how quickly the Cubs’ collection of young hitters will mature. Off-Field Story Line: What else but Bryant’s delayed debut? There’s no aspect of the decision that hasn’t been dissected and turned into a take. There’s the numbers-based “back away from the ledge” argument: If the projections are right to peg Bryant as a 4.5-win player over 600 plate appearances, the difference between him and Olt3 — between any prospect and Olt, really, but let’s stick with one budding superstar at a time — over the 12 days the Cubs have to keep Bryant in the minors to delay his free agency until after his age-29 season is about 0.3 WAR. The odds of that difference swinging even a single game from a win to a loss, and of that loss being the one to keep the Cubs out of the playoffs, are remote.4 One can easily see why the Cubs would be willing to take that risk in exchange for an extra year of prime Bryant, especially since Scott Boras clients are unlikely to sign extensions. There’s also the argument that if the Cubs are assigning Bryant to Triple-A solely for service-time reasons, then what they’re doing goes against the spirit of the CBA. To which some say, “Too bad: This is business, and if the MLBPA wanted to prevent this practice, it should have done a better job of bargaining.” To which others say: “The near-certainty that the Cubs can get away with pretending that they don’t think Bryant is ready doesn’t mean they aren’t doing something wrong.” To which I say: Let’s talk about service time in 2016. But for now, let’s talk about baseball. Projected Record and Over/Under: 84-78 — UNDER. It could come together, but I’m betting it takes one more year of .500-ish purgatory for an intimidating Cubs team to take shape. Regardless, the Cubs should be everyone’s default MLB.TV team this year. To put that 73 figure into perspective: MLB shortstops averaged an 87 wRC+ over the same span. Only four qualified players hit worse than Brewers first basemen did as a group over the past two years: B.J. Upton, Adeiny Hechavarria, Zack Cozart, and Alcides Escobar. On most teams, only elite defensive shortstops can get away with bats as bad as those of recent Brewers first basemen. And the Brewers’ weak hitters weren’t even good fielders for first basemen. Against that backdrop, Doug Mientkiewicz would look like Mark McGwire, and Lind looks like Lou Gehrig. The 31-year-old has a balky back and a big platoon split: In 892 plate appearances versus southpaws, Lind has managed a 53 wRC+, which is about what the Brewers got from Yuniesky Betancourt and Alex Gonzalez at the position in 2013. But at least Lind hits righties (128 wRC+), which gets the Brewers about 70 percent of the way to a full-time first baseman, closer than they’ve been since Corey Hart left to see knee surgeons in other cities. The Brewers can cover for Lind’s weak side with Luis Jimenez or occasionally with starting catcher Lucroy. Worst Offseason Move: None: The Brewers made few major moves over the winter, so there wasn’t much to dislike. In a sense, though, Milwaukee’s offseason started last summer, when GM Doug Melvin acquired Gerardo Parra at the July 31 non-waiver deadline and Jonathan Broxton at the August 31 waiver deadline. Parra should be an asset off the bench, but Broxton is a big expenditure for a team with a bottom-half payroll. Almost 10 percent of Milwaukee’s payroll is going to a reliever who’s prone to injury, losing fastball velocity, and striking out batters at a little more than half the rate he did during his Dodgers heyday. If you want to raise an eyebrow about a Brewers acquisition, Broxton is your best opportunity. Greatest Team Strength: The lineup. The Brewers had a roughly average offense last season, but hitting has the potential to be a bigger factor in their favor in 2015. The biggest question mark is Braun, whose thumb injury completely changed his hitting style last season (see below) and made him a nonfactor down the stretch. 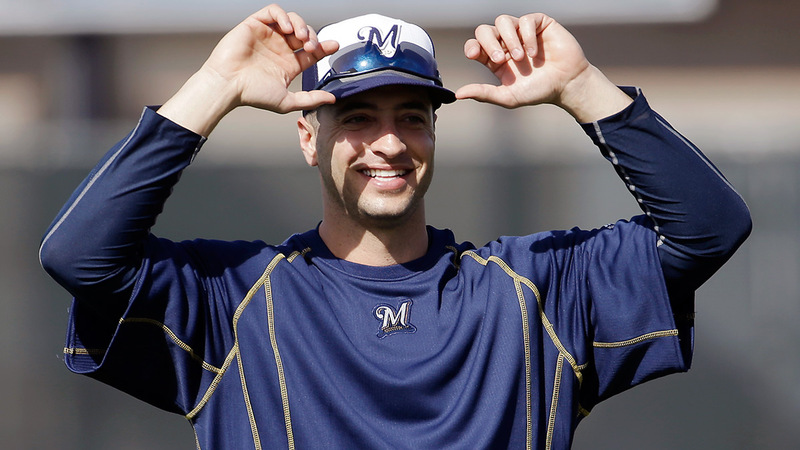 Debilitating pain forced him to have noninvasive surgery in October, which the Brewers hope has corrected the problem. If Braun could return to even his 2013, pre-suspension performance level, when he had a less severe issue with the same digit, it would give the Brewers the unnavigable heart of the order they lacked at times last year. With Lind plugging the lineup’s weakest point and Lucroy and Carlos Gomez continuing to outperform expectations, the Brewers have the makings of a strong crew from one to seven, with Jean Segura the only hitter projected to be below average. The world is a better place when the Brewers have bats. Greatest Team Weakness: A lack of elite pitching. The Brewers staff doesn’t have a discernable drop-off at the back end, but that’s partly because there’s no one elite up front. Milwaukee’s best projected starter is Fiers, a 29-year-old with 35 career MLB starts and a 90 mph fastball. Look past his imperfections until you see his strikeout rate, and Fiers can pass for a breakout candidate, but only the Diamondbacks, Blue Jays, Orioles, Royals, Rangers, and Rockies have an “ace” with a less impressive projection. The bullpen tells the same story: Will Smith leads all projected Milwaukee relievers with a modest 0.5 WAR. Pitchers noticed that Braun could be busted inside, and they showed no mercy, aiming more pitches toward his vulnerable hand. Braun tried to compensate for his inability to pull the ball by aiming the other way. Although his total run value on all batted balls was lower last season than it had been in his big offensive years, he had more success going to the opposite field in 2014 than he had in 2013, even as the impact of his pulled batted balls continued to crater. Braun’s percentage of hits that went the other way was the sixth-highest of 147 qualified hitters, behind low-power players like Joe Mauer, D.J. LeMahieu, Adam Eaton, and Nori Aoki, and another hitter having a nightmare year, Allen Craig. This GIF of two heat maps from FanGraphs compares peak Braun (2011) to injured Braun (2014), displaying (from the catcher’s perspective) the pitch locations where he did the most damage. 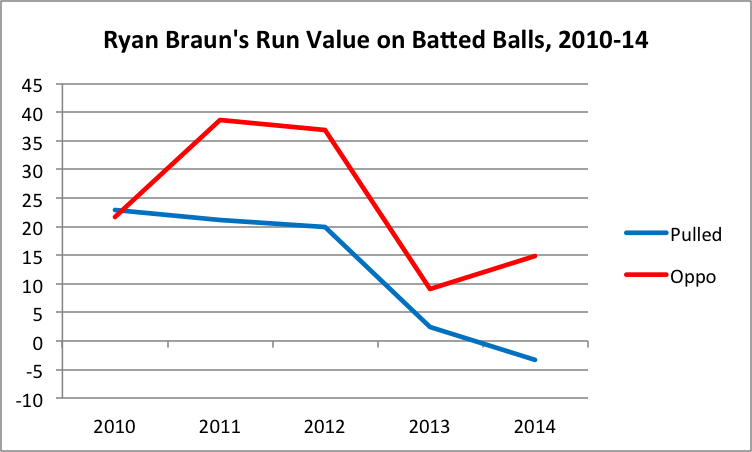 In 2011, Braun had almost no weak spots. In 2014, he continued to punish some outside pitches, but his production dried up inside. 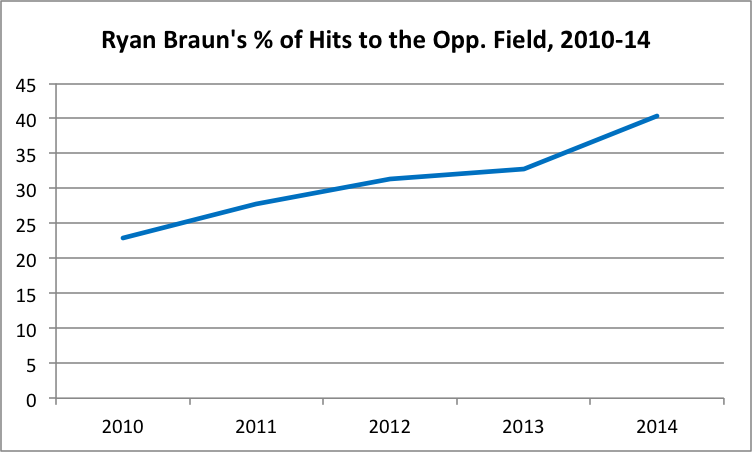 Braun also posted his highest swing rate and chase rate since 2008, as his mid-career selectivity deserted him. The difference was stark: The thumb caused Braun to perform like a much older, weaker hitter, as if he’d bypassed his decline phase and skipped straight to retirement age. Although there’s no guarantee his injury won’t recur, we should be able to tell fairly quickly if Braun is back once real games begin. If he’s pulling the ball with authority early on, and pitchers start to stay away, it will bode well for the Brewers. Noteworthy Miscellaneous Stat: Lucroy is more valuable when he’s wearing a catcher’s glove, so it might seem like a waste to deploy him as a platoon partner for Lind. However, the Brewers lose little to no receiving skill with backup Martin Maldonado behind the plate. In fact, his framing projects to be 20 runs above average (seventh in MLB), according to Baseball Prospectus’s Called Strikes Above Average, compared to Lucroy’s 18 (ninth). Maldonado is nearly Lucroy’s equal in blocking and has a higher career caught-stealing rate, making Milwaukee the only team with two top-10 framing catchers. Off-Field Story Line: None. The Brewers have a tiny TV deal that pays them only $20 million per year, and it doesn’t expire until 2019, so they’re still years away from getting a piece of the revenue pie other teams have devoured. There’s no front-office or ownership turmoil, no sizable percentage change in payroll on the horizon, and little drama surrounding the roster. Hank the Dog continues to be the Brewers’ biggest non-baseball news. Projected Record and Over/Under: 79-83 — UNDER. The Brewers should hover around .500, and if they get lucky, they could go on another run-differential-defying spurt like last year’s club did before finding its level. However, these Brewers don’t have the top-tier pitching to compete with the Central’s upper crust, and their offense isn’t so powerful that they can slug their way to a title. More mediocrity awaits. *Starter Homer Bailey is rehabbing from September surgery to repair a torn flexor tendon and should return sometime in April (say it with me) barring any setbacks. Best Offseason Move: Selling high on Alfredo Simon. The Reds lucked into 32 useful starts from a 33-year-old who had pitched exclusively out of the bullpen since a failed rotation trial with Baltimore in 2011. They then lucked into convincing the Tigers that Simon’s luck/defense-aided ERA was worth shortstop Eugenio Suarez and starter (but likely long-term reliever) Jonathon Crawford, a pair of young, low-ceiling players who might not amount to much but almost have to amount to more than a single season of Simon. At the very least, the Reds have found someone in Suarez capable of carrying on Zack Cozart’s light-hitting legacy. Worst Offseason Move: It wasn’t so much any one move as it was the lack of a unifying principle. The Reds seem to be stuck in an awkward spot, both buying and selling veterans and shedding and assuming salary without a clear indication of when they expect their next contending team to materialize. It probably won’t be this summer, so their stance at the deadline should help clarify where they’re headed from here. Greatest Team Strength: Defense. The Reds are one of baseball’s least likely shifters, but they have the division’s second-best defense, by the projections, and they’ve finished in the top three in Defensive Efficiency in each of the past two seasons. Even though Billy Hamilton’s bat hasn’t delivered as hoped, the converted infielder has made the most of his speed in center. Greatest Team Weakness: The rotation. The Reds recently decided to move former pitching prospect Tony Cingrani to the bullpen, which is where injury-riddled, overly fastball-reliant pitchers with big platoon splits belong. But the back of the rotation he left behind is even less encouraging: Anthony DeSclafani might join Cingrani in a relief role before long; Marquis hasn’t managed a full, healthy season since 2009; and Raisel Iglesias is an unknown whom the Reds can’t decide how to use. If Homer Bailey encounters any issues on the last leg of his return from September surgery, the bullpen could collapse from exhaustion by August. Player We Can’t Wait to Watch: Last year, everyone wanted to watch Hamilton, and that was fun for a while. 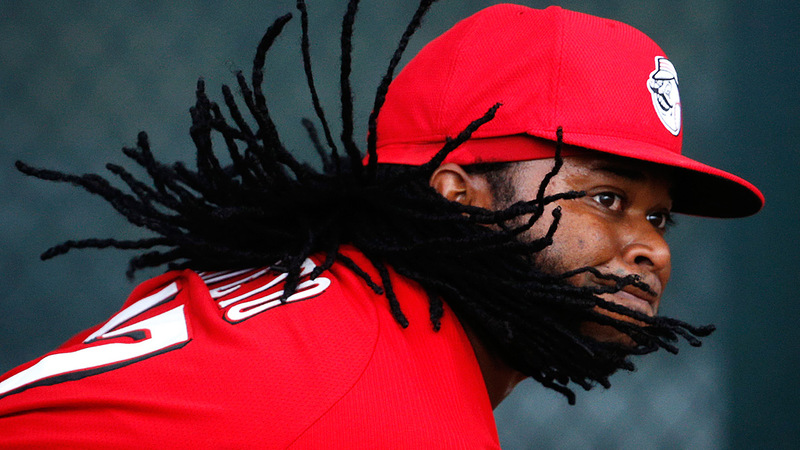 But on days when Johnny Cueto is pitching, no Reds fans should have eyes for anyone else. Cueto is an anomaly in almost every way: His signature, twisting delivery might actually be his most conventional quality. He gains velocity as games go on. He changes his motion without warning and varies his time between pitches. He balks to hold baserunners (and gets away with it). He shows Maddux-esque command. And he constantly tinkers with his pitch mix. Only Clayton Kershaw has a lower park-adjusted ERA over the past four seasons, which may or may not be attributable to a knack for weak contact. Cueto is a wonderful freak. 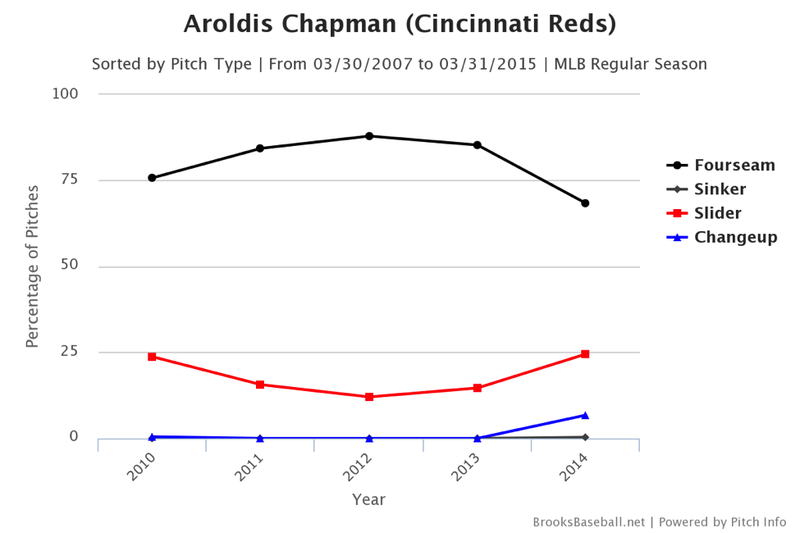 Speaking of freaks: Aroldis Chapman is evolving, which gives us another pitcher story to track. Chapman threw harder than ever in 2014, but he also dialed back his four-seam fastball usage to its lowest level yet, mixing in more sliders and some (89 mph) changeups. Eventually, his fastball speed will sink to more mortal levels and he’ll have to mix in more off-speed stuff to get by. As long as he’s averaging triple digits, though, the sliders are sadistic. Noteworthy Miscellaneous Stat: Earlier, I wrote that the Cubs have a wide range of potential outcomes, with the biggest gap between their 10th- and 90th-percentile ZiPS-projected records. The Reds are on the other end of the volatility spectrum, with only an eight-win separation, tied with the Phillies and Rockies for the narrowest gap. There’s little hope of upward mobility here, even if everything breaks the Reds’ way. Off-Field Story Line: The ongoing Joey Votto–Brandon Phillips–Marty Brennaman symposium to decide whether OBP is evil, much to the dismay of the 95 percent of the baseball world that considers the matter settled. Only eight more springs until Votto’s walk year last season in Cincinnati. Projected Record and Over/Under: 76-86 — PUSH. With Votto injured, Ryan Ludwick and Bruce banged up and slumping, Phillips declining, Hamilton disappointing, and Cozart being Cozart, the Reds had one of the weakest lineups in baseball last season, despite Mesoraco’s breakout and Todd Frazier’s dependable bat. Votto’s return, Bruce’s likely rebound, and Marlon Byrd’s arrival should restore the scoring to a respectable level. If GM Walt Jocketty keeps the roster intact, the Reds could rival the Brewers, but if he resigns himself to a rebuild and deals Cueto and Byrd at the deadline, Reds fans will be in for some bad baseball in the second half. The projection above that calls for regression knows about the younger Arrieta’s sketchy stats, but not about the current model’s mechanical tweaks and improved pitches. Or La Stella, which is even slighter. Although with Heyward now in the division, it’s worth noting there is a precedent for that unlikely confluence of events.